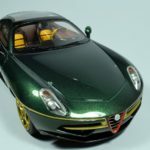 There are a handful of brands that we have not yet explored on DiecastSociety.com. 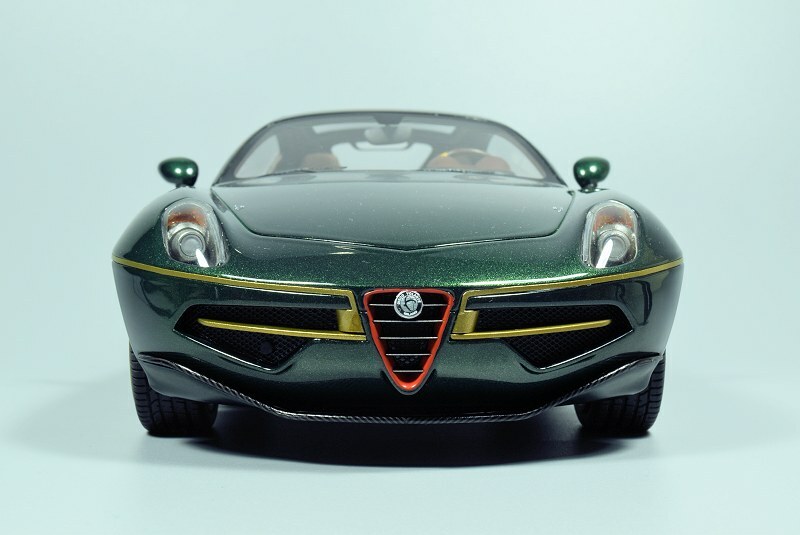 When the team at Tecnomodel graciously sent us their new 1:18 Alfa Romeo Disco Volante Touring Superleggera, we were excited as a pig in mud. 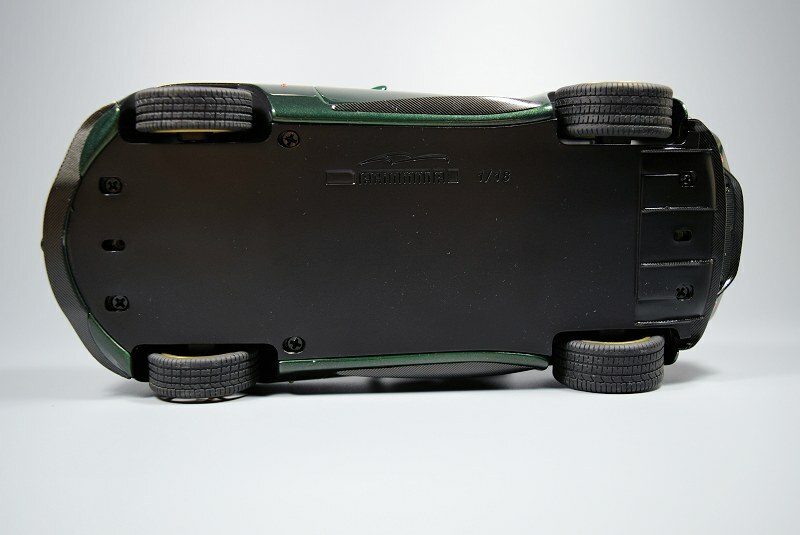 Tecnomodel is an Italian scale model manufacturer. 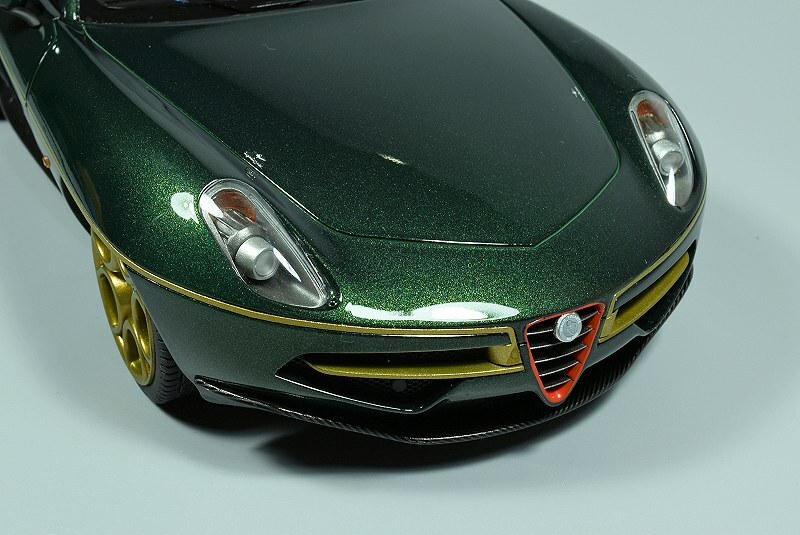 They specialize in 1:18 and 1:43 scales, the bulk coming from 1:18. 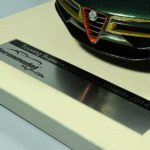 Their pieces are hand made and the base material is resin. 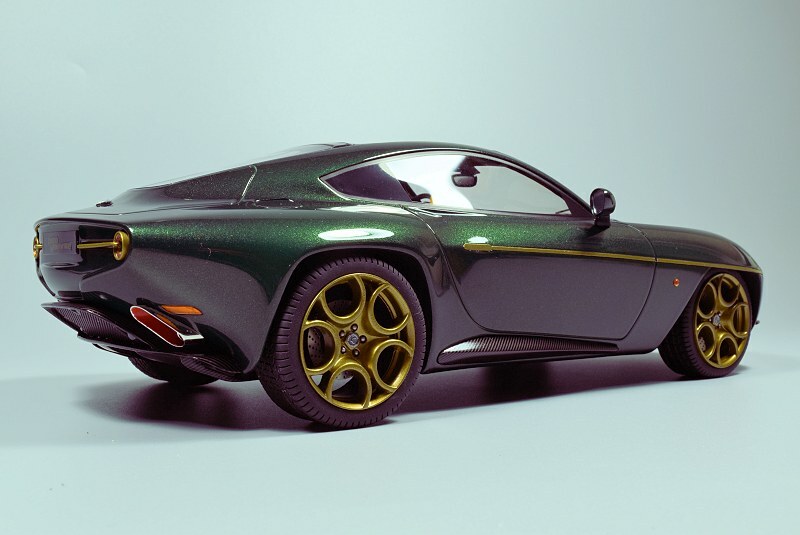 What makes them unique, and stand apart from the competition is their fortitude to explore the non conventional, and the Disco Volante Touring Superleggera is a perfect example. 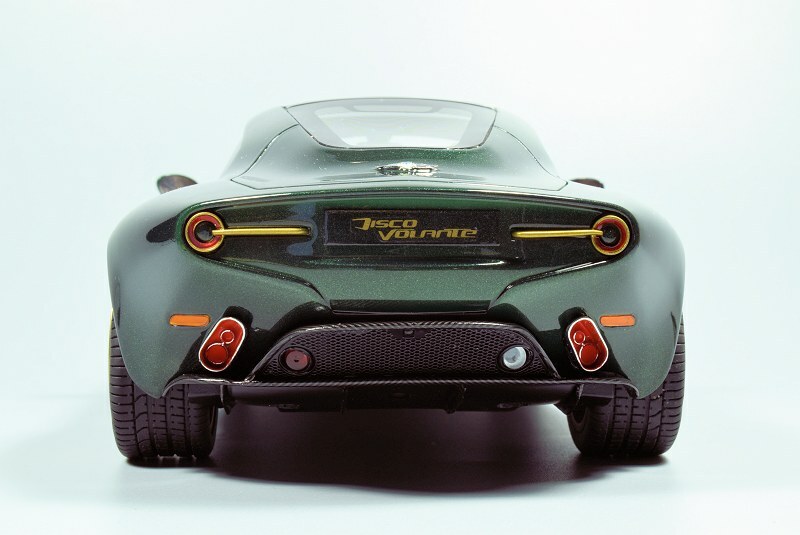 I first set my eyes on the Disco Volante in an episode of Top Gear. First impressions were WOW! The lines of this car are just beautiful. 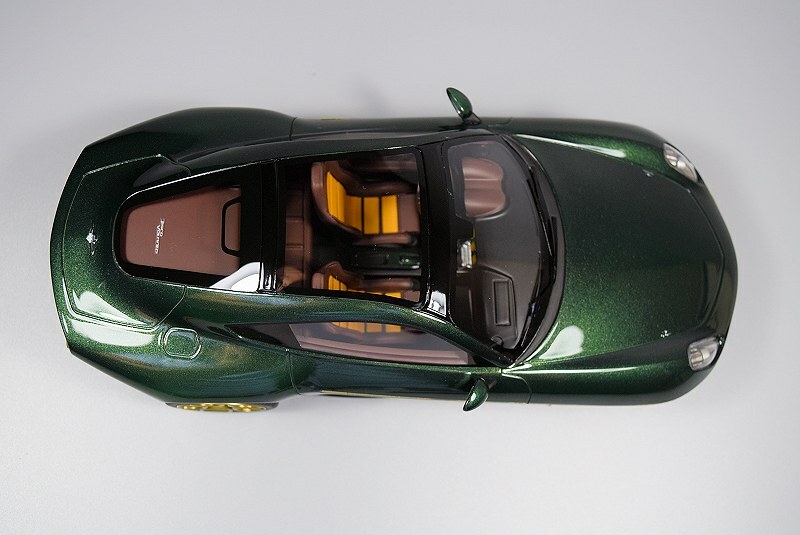 It definitely makes the top ten list of most beautiful cars of all time in my opinion. 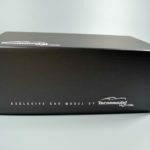 Since this is our first review for the Tecnomodel brand, I thought I would share the model’s packaging. 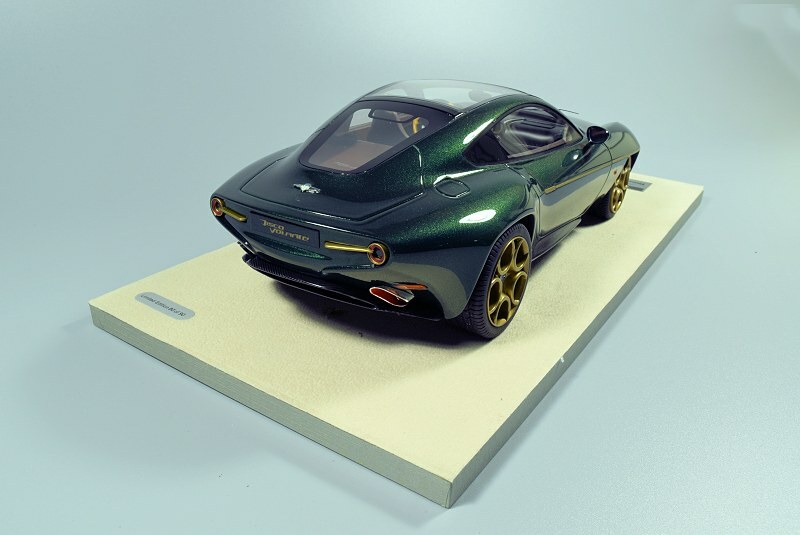 The Alfa Romeo Disco Volante Touring Superleggera comes from Tecnomodel’s “Mythos” Series, which is a notch below the standard Tecnomodel line. 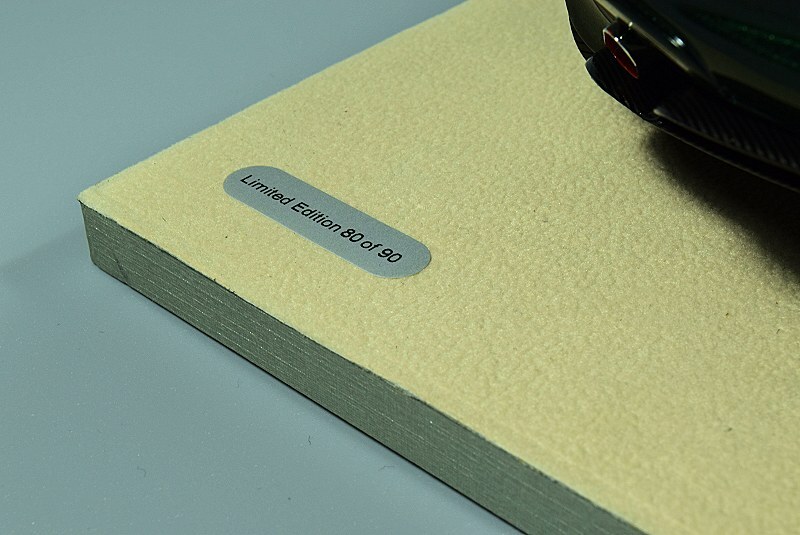 The exterior packaging is well thought out and designed. 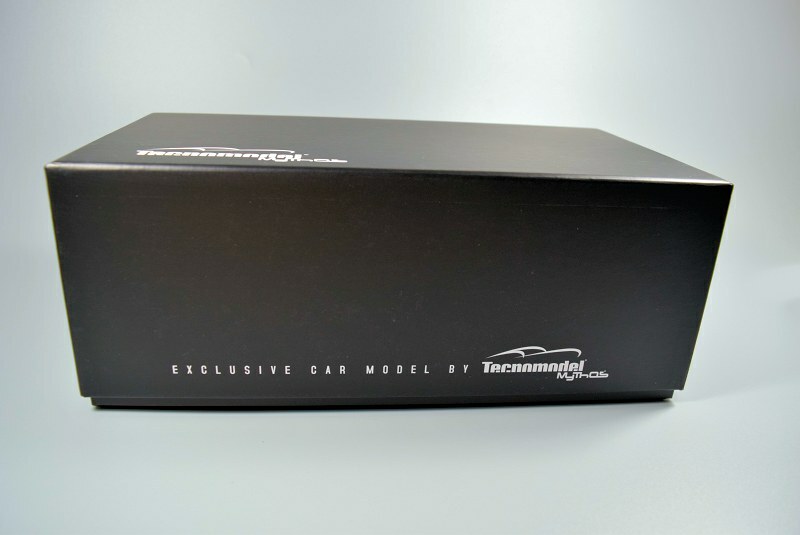 Obviously the exterior colour is black with various Tecnomodel logos and related copyright information. 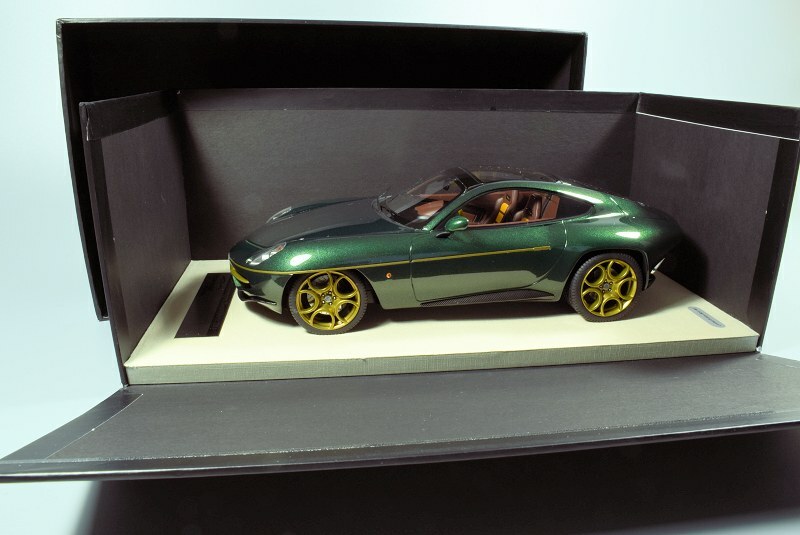 Once opened, you notice the model is cocooned in cardboard outer trim and stationed on a wood base covered in a felt fabric. 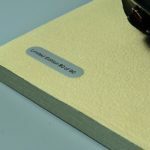 Simply remove two protective covers underneath the base to reveal two screws, unscrew each, and the model is free. One thing I would note, my specimen was so tightly compressed it left tire marks on the top of the fabric. If you choose to store your models within the original packaging I would highly recommend you loosen the grip here. 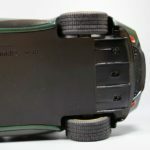 This will prevent premature flat spots and tire degradation. 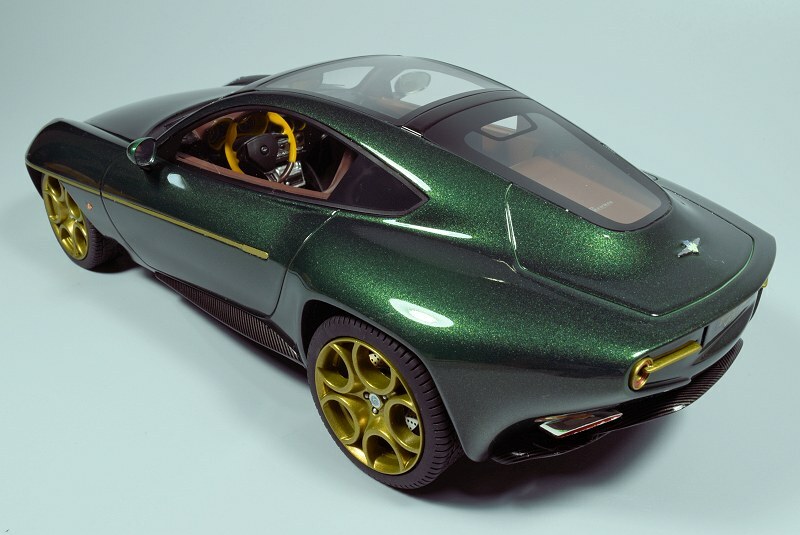 The exterior of the Disco Volante is finished in a Metallic Green and features Gold wheels. Let me tell you, the paint is absolutely flawless. 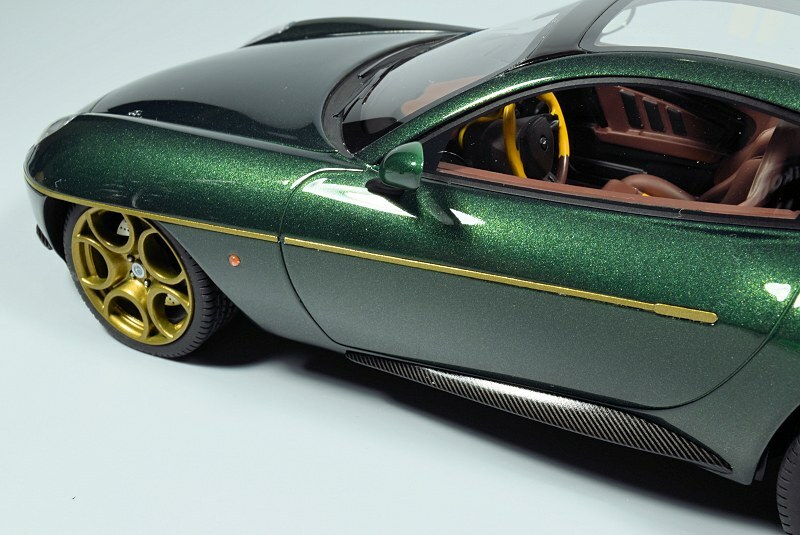 The metallic flake is a perfect blend. 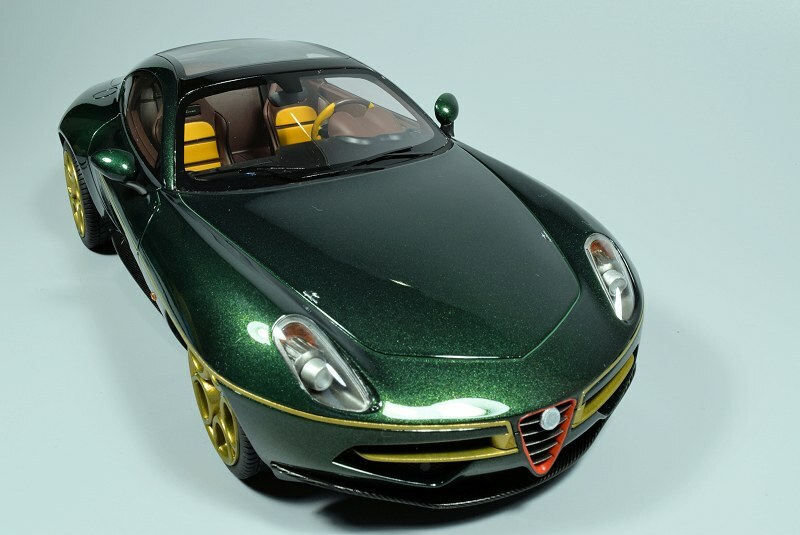 What is really impressive is the Gold pin-striping that drives from the mid side to the front fascia. 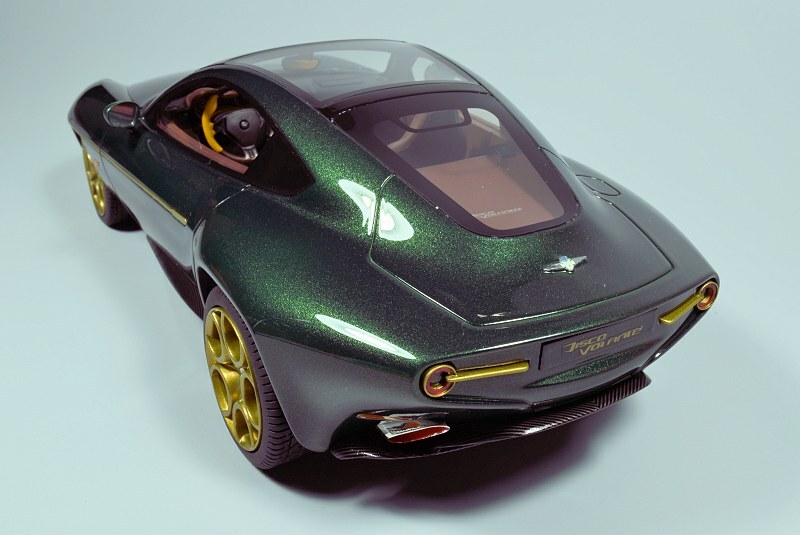 The execution is very clean and meticulous attention to detail is definitely at the forefront. 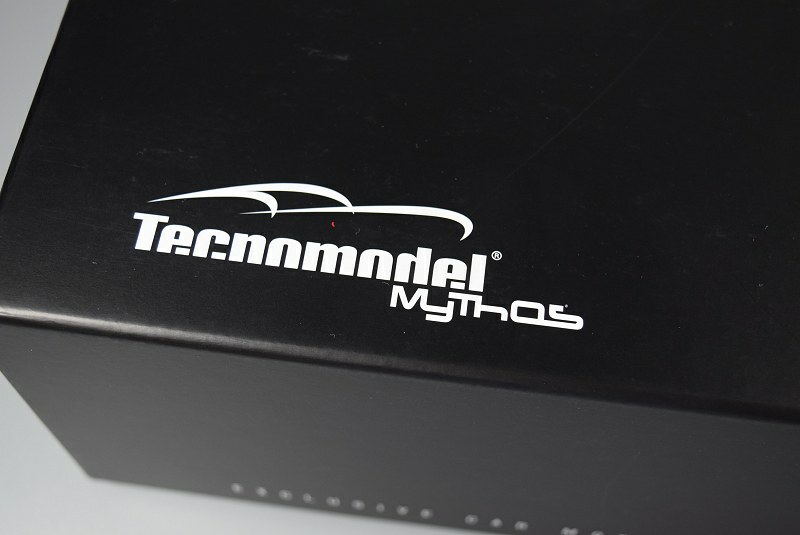 Tecnomodel even reproduced the two very small logos that adorn the top of the front hood – left and right. 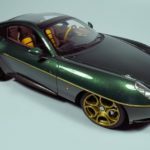 The models fit and finish definitely excels beyond your typical GT Spirit piece, but so does the price point. The overall lines capture the original without a doubt. 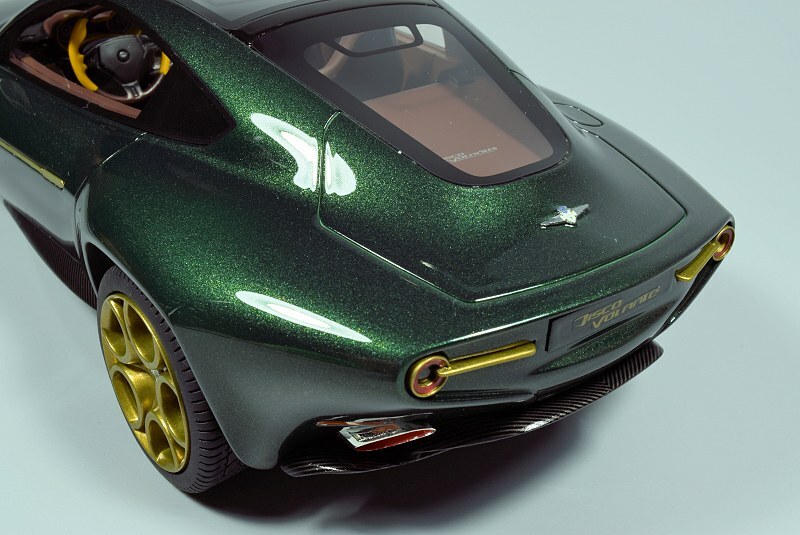 Keep point, the Gold pin-striping has a defining line on the overall ride stance. Based on images we studied it is spot on! 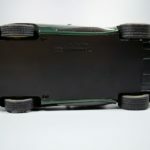 Shutlines and panel gaps are perfect, but this is given with nearly all closed-body, resin models. The weakest link on the exterior are the wiper blades, but now I’m nit-picking. 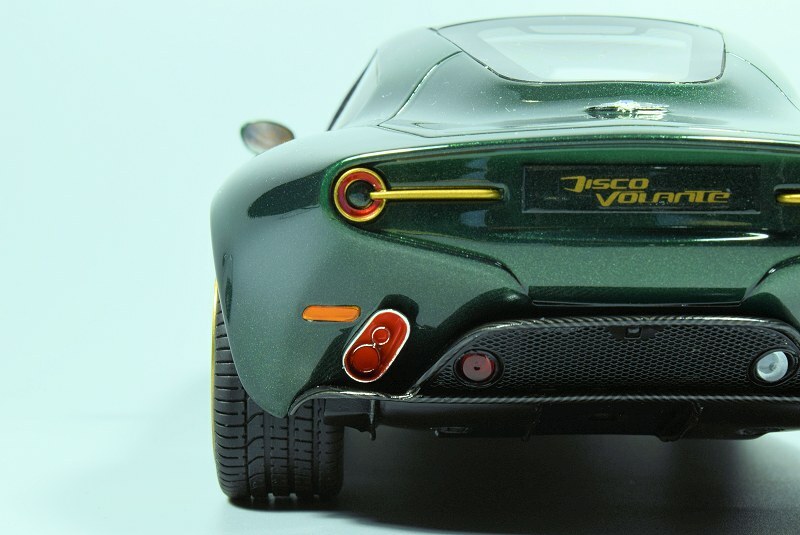 The front of the Disco Volante is very subtle other than the mix of four colours coming together at the nose. If I had one complaint it would be the finish work around the red centre grille. There is a little debris from the exterior green that could have been a little cleaner. Other than this, the pluses outweigh the negatives for sure. The grilles are perforated throughout. 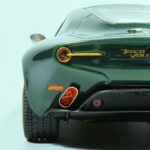 The carbon fibre work on the lower chin spoiler is clean and within scale. 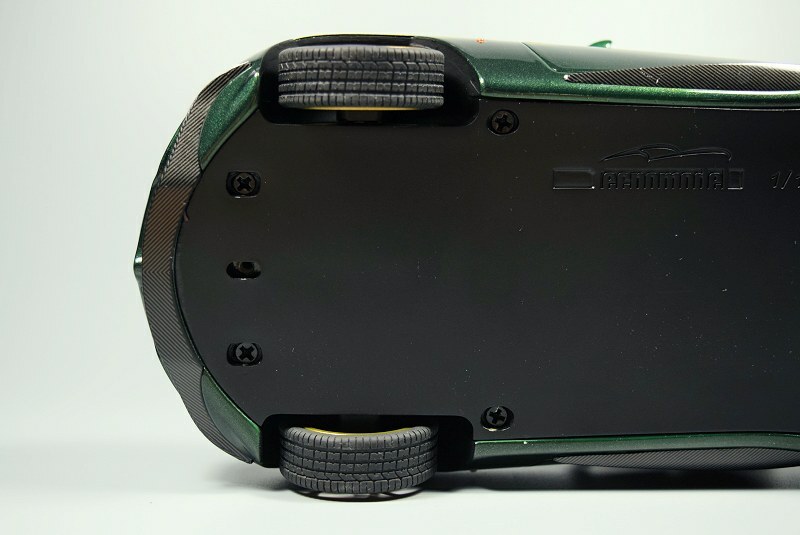 The most impressive is the headlight fitment and detail. 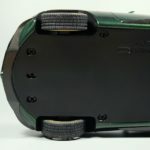 As with some models we reviewed in the past, the fitment of the headlight unit isn’t always clean and true. These are perfect! 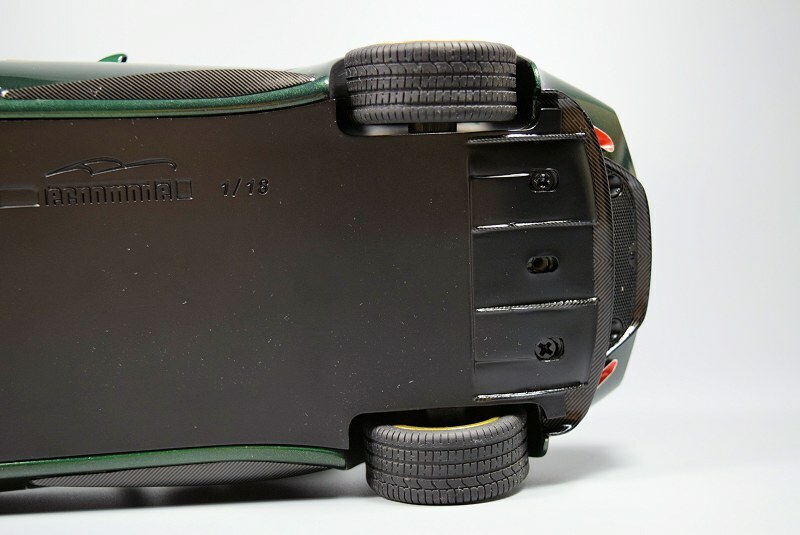 The rear is much like the front, excellent workmanship throughout. 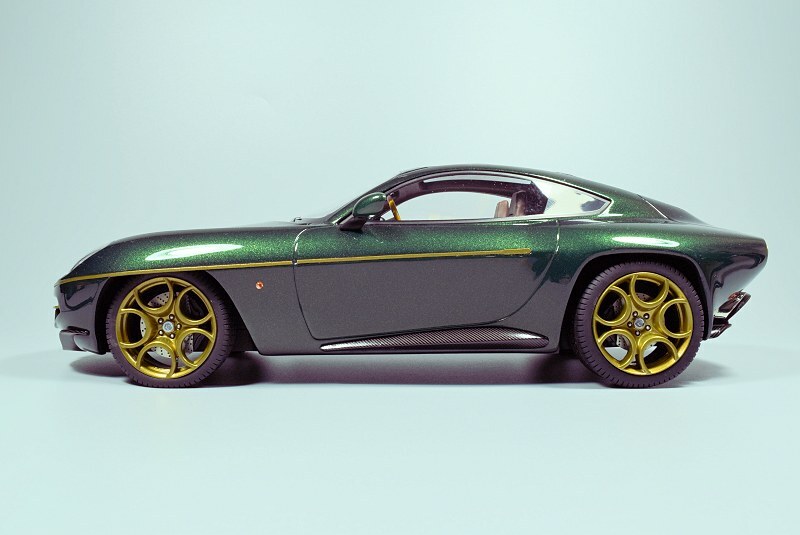 The choice of materials and colours mirror the original nicely and it shows. 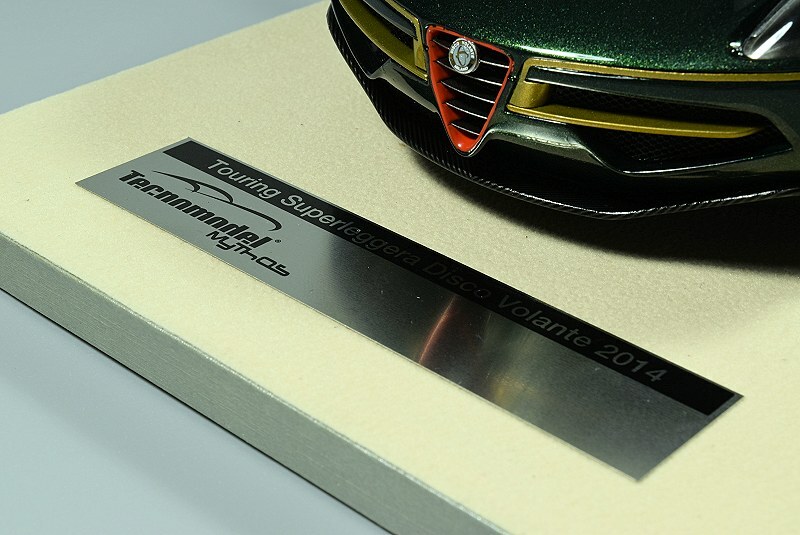 Tecnomodel even includes the ‘Disco Volante’ logo in the lower section of the rear glass. The wheels are up there with some of the best in the business for sure. 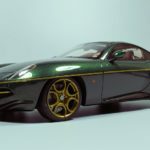 This includes the likes of AUTOart and GT Spirit. 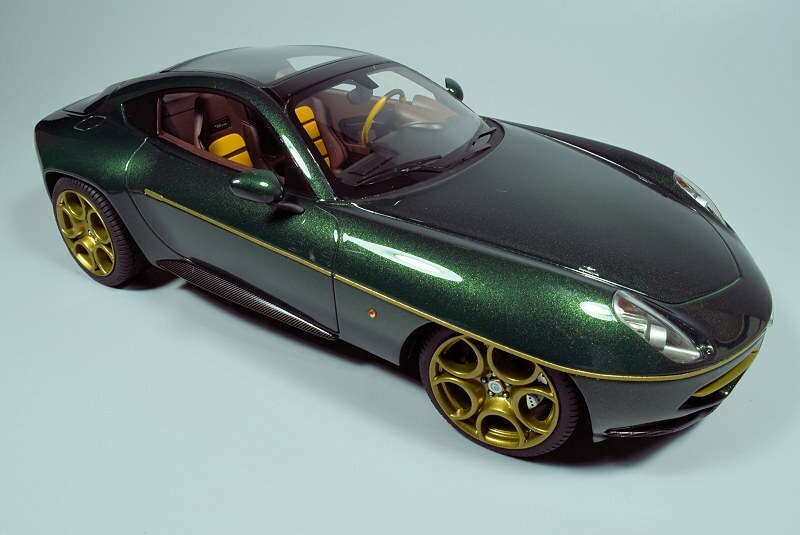 The Gold paint is well done. 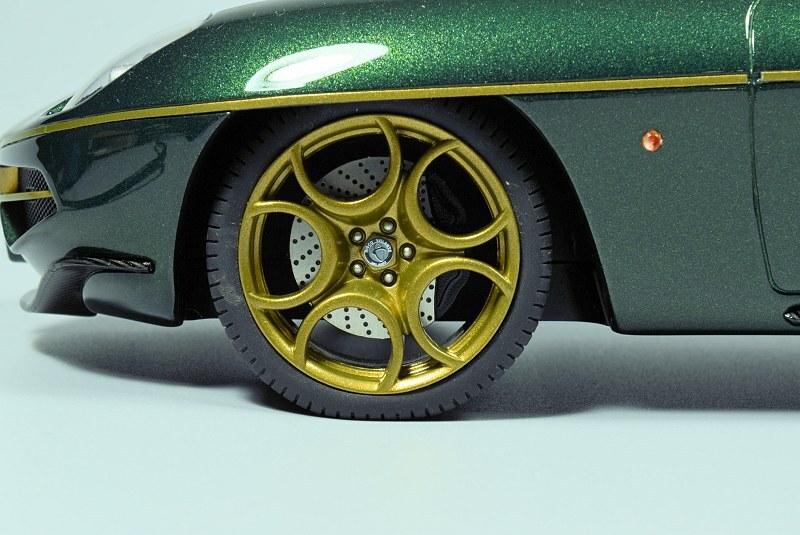 The individually painted lug-nuts is another nice touch that excels the model even further. Rotors, calipers and tires complete this already impressive package. 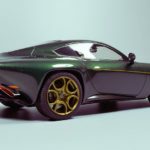 Well done Tecnomodel! 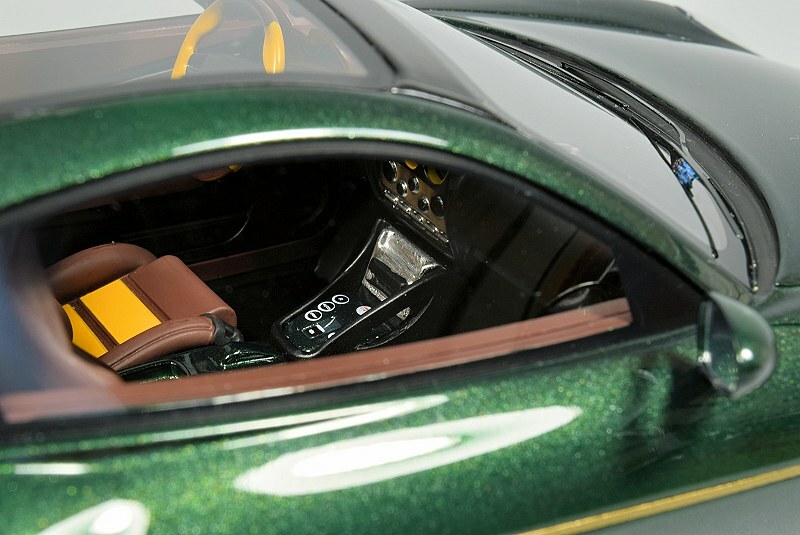 The interior of the Disco Volante Touring Superleggera might be a little over the top for some, though it neatly blends with the exterior. 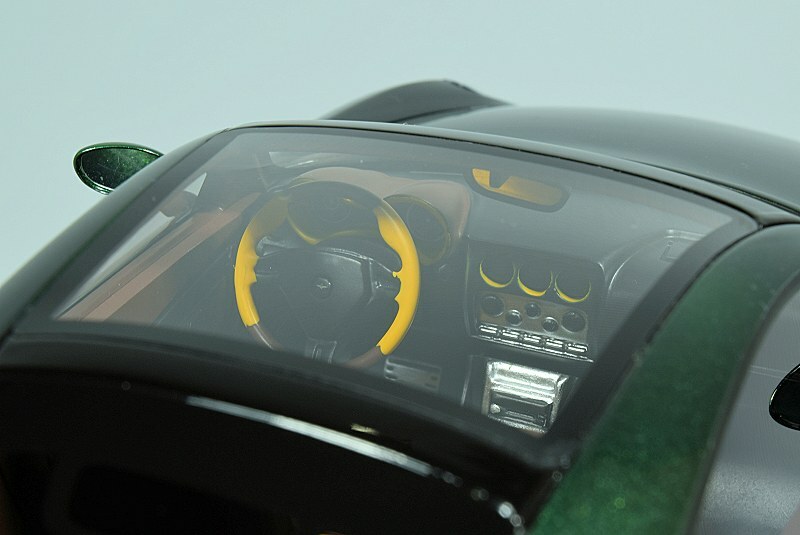 All the elements seem to be here, dash, door cards, and centre console are all detailed in-depth. 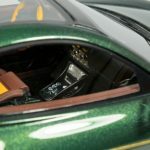 There is no flocking anywhere, but I’m not sure what the interior breeds on the 1:1. 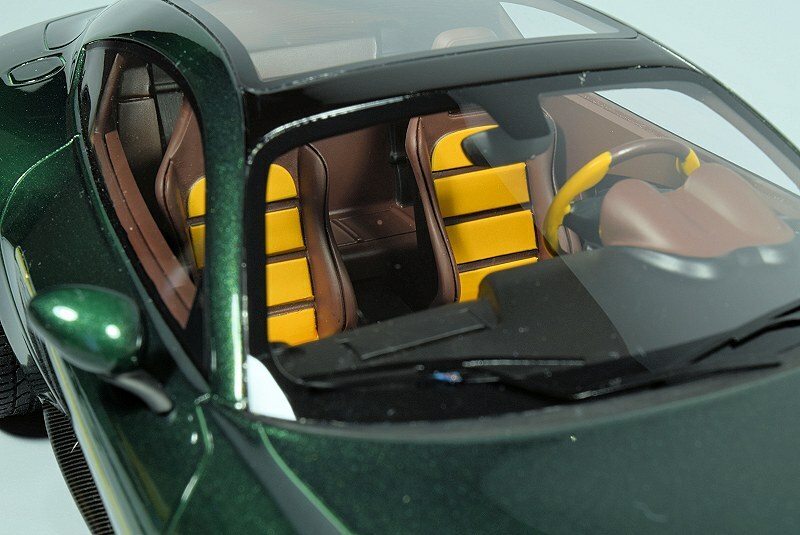 Overall the interior execution exceeds lower priced resin models. 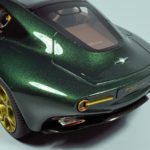 This was the first Tecnomodel piece to be placed through the paces here at DiecastSociety.com and let me tell you, I’m very impressed with it. 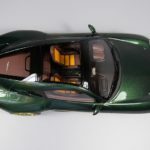 There is no doubt the car alone speaks volumes on the physical appearance alone. Couple that with some great scale modelling and you have a winner. Tecnomodel have definitely won me over. 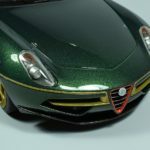 This is one of the finest resin closed-body pieces we’ve seen since we started this resource website, it comes highly recommended. We’re hoping to see more from Tecnomodel soon. Enjoy the pics! 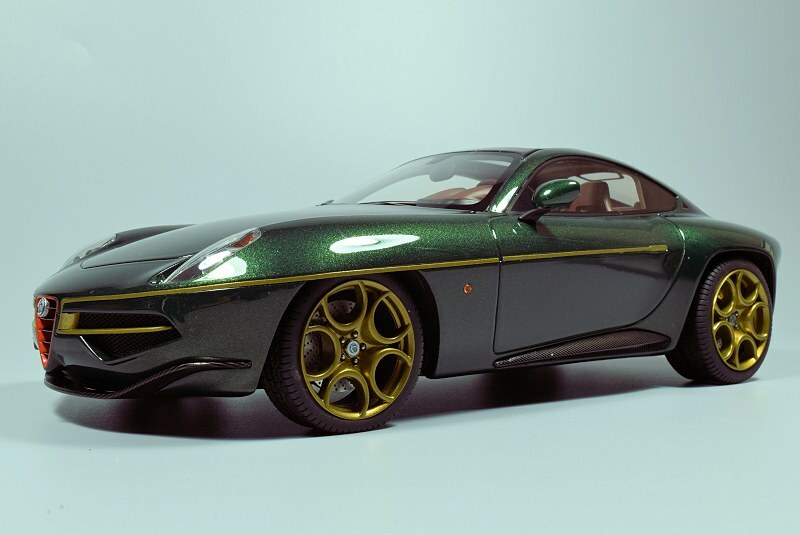 1 Response to "REVIEW: Tecnomodel Disco Volante Touring Superleggera"
A very interesting colour scheme, that.